My episode airs on the DIY network. Uncommon Threads - a new DIY Network show on everything BUT knitting! 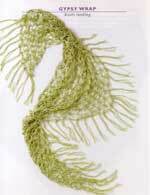 In "The Crochet Class" episode, I teach 3 knitters how to crochet and make an easy triangular shawl. Here I am on the set (4 months pregnant!) with the lovely host, Allison Whitlock. Crochet instructor Katherine Lee convinces the L.A. Knitsters to exchange their knitting needles for crochet hooks by comparing the basics of the two needlecrafts to teach crochet. After learning the how to hold the hook and create foundation stitches, we use our new knowledge to crochet a simple shawl. Twenty of my newest designs. Available in bookstores nationwide and at Amazon.com. A gorgeous new book from my favorite knitting shop in Los Angeles. I contributed a breathtaking evening gown knit in an antique lace pattern. A new collection from Lark Books' Terry Taylor. I contributed 3 poncho patterns to this book - a lush mohair cowlneck, an open, lacy and long poncho, and a chunky, boldy textured poncho. A new crochet collection from Lark Books' Terry Taylor. Features 5 of my designs: a multi-colored scarf, a delicate flower choker, a poncho, a bright tote, and an easy shawl. 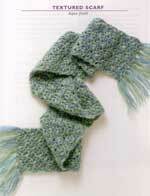 A great book for any crocheter featuring a wide range of scarves, shawls, and wraps. This book includes 4 of my designs: 3 unique scarves and 1 airy, lacy shawl. Fun projects for babies. I designed the cable knit blanket featured in this book. 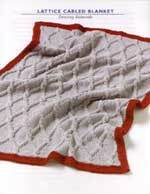 This Collared Wrap Cardigan was in the August 2004 issue. This V-Neck Sweater was featured in the October 2004 issue. This Hooded V-Neck is from the December 2003 issue. This Shawl Collar Cardigan was featured on the December 2002 cover. This Notched-Collar Jacket is in the December 2002 issue.